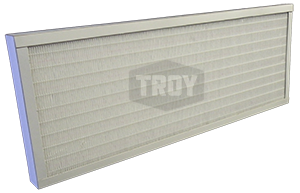 Troy manufactures custom engineered filtration components for electronics equipment as well as filters for systems used in the manufacture of microelectronics. Electronics air filters, medical air filters, computer air filters, data center air filters, and filters for EMI shielding applications, all designed and manufactured here in the United States. Our engineers will assist in the development of a suitable air filter if needed. Contact us to request a prototype, or for more information.